of our NNHS Schoolmates who now reside in Florida. Please report in and let us all know how you fared. 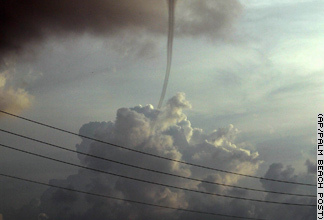 A waterspout drops from the clouds above the Gulf of Mexico prior to Hurricane Charley’s landfall near Sanibel Island. Island residents were under a mandatory evacuation Friday -- the island drawbridge closed to traffic at 8:00 p.m.
Photo by CNN.com A warehouse in Arcadia, FL is seen after being completely destroyed August 14, 2004 after Hurricane Charley swept through the area. 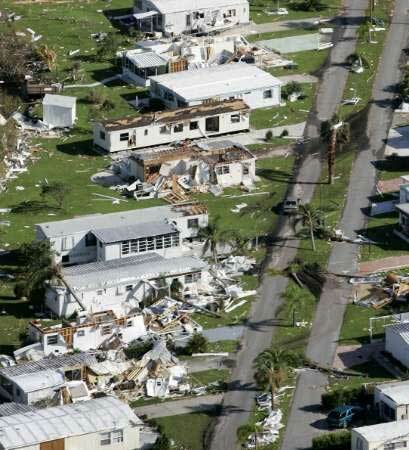 REUTERS/Pierre Ducharme Trailer homes are destroyed as damage is surveyed after Hurricane Charley blasted through Southwest FL above Punta Gorda, FL, August 15, 2004. 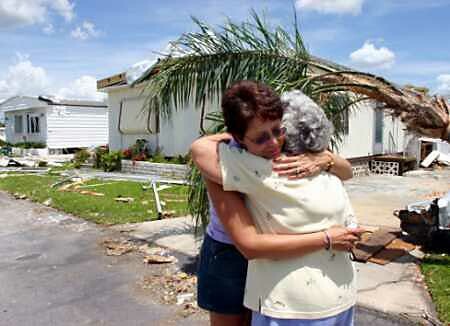 Photo by Marc Serota/Reuters Angel Sampson (L) hugs her mother-in-law Helen after seeing the damage to their mobile home in Windmill Village in Punta Gorda, FL, August 16, 2004.
with ferocious 145 mph (233 kph) winds and a flooding 15-foot (4.5-meter) storm surge. MIAMI (Reuters) - The death toll from Hurricane Charley's destructive rampage in Florida has risen to 22, and about 388,000 people remain without power in the state, government officials said on Thursday. Charley, the strongest storm to hit Florida in a dozen years, hit the southwest coast last Friday with winds of up to 145 mph, demolishing mobile home parks and damaging tens of thousands of buildings. The new death toll, which rose by three, was issued by the Florida Division of Emergency Management. In addition to the 22 dead in Florida, the storm killed five people in the Caribbean. 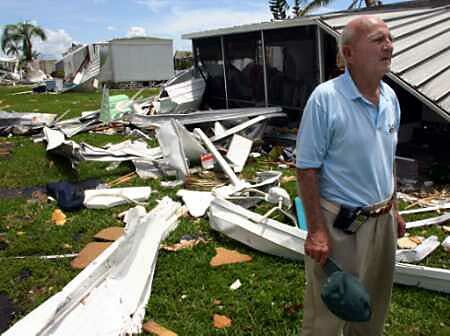 Local officials had initially expected many more dead, particularly because of the widespread damage to many mobile home parks in Charlotte County. Thousands of people were left homeless by the storm, and officials said 2,626 were still in shelters by Thursday. Many others had found refuge with relatives and friends, or in hotels. in short order. Stay dry. Thanks, Joe! We'll keep y'all in our prayers! Tampa Bay was spared the fury of Hurricane Charley, and we only received some wind and a bit of rain, but no damage. from the horrible surge that would have put Tampa under water. Lee County caught the brunt of this category 4 hurricane which hit Sanibel with 145 MPH winds. I just watched a beautiful sunset. WHEW! What a relief! Thanks, Joe! We were spared any ill effects of Charley. We did dodge the bullet in Tampa Bay, when the storm turned east to make landfall at Fort Myers and Port Charlotte. Thanks again, Joe! I'm so glad that you and yours were spared! Charley was turning east earlier than expected, and heading straight for us. Fortunately, Charley degraded to a Class 2 Hurricane, and the eye missed us, in Disney World, by about 15 miles. a few trees/signs down, nothing too big. Then, on Sunday afternoon, we headed south, back to south Florida. We drove through Kissimmee, about 10 miles south of "Mickey-land". What a shock! It was a real disaster area! Thank God it missed us by a few miles. 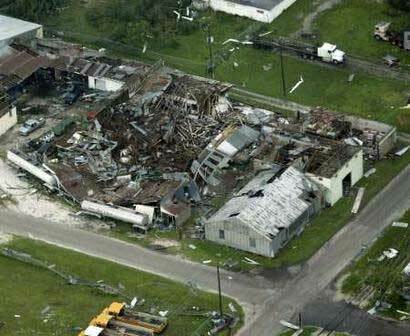 Here's the lesson we learned: never underestimate the Power of a "Class 2" hurricane. The "Class 4" that hit the coast at Punta Gorda was a "killer" hurricane. When in doubt, bail out! Evacuate to a safe haven if you live in a coastal area, or, especially, if you live in a mobile home! 100 to 150 mph winds are incredibly destructive. Don't take chances with deadly forces. WOW! Thanks for letting us hear from you, Craig! We were very lucky and Charley turned in toward the coast about one hundred miles south of where originally expected. I feel sorry for those poor folks in Punta Gorda but am thankful that we in North Central Florida got through unscathed. My company is sending trucks down there all week for cleanup, they need all the help they can get. Say a prayer for the folks in Southwest Florida. And I certainly enjoy the newsletters. We were directly in the path. It went right overhead. Winds 115 mph. We were very lucky. enclosures twisted like they were made out of pipe cleaners and worse damage to the roof. YOW! Thanks for reporting, Jean! We're so relieved to hear that you're okay! I'm only 15 and don't know much but I hope this story can help someone like it did for me. and I was there during Hurricane Charley. Luckily, no one I knew was killed or injured, but I am sorry for those who were. I remember the next morning, going outside and seeing everything the hurricane had destroyed. There were trees that had been torn out from the ground; some even were turned upside down. Some cars, houses, and trailers had been dented and smashed. Even billboards and signs were laying in the middle of the road. But there was one thing that I thought was weird. Almost everyone in Florida has a pool, with a screen-like thing around it, to keep out bugs I'm guessing. These screens look pretty flimsy and like they would fall down in an instant, yet none of them were messed up at all. cars, and houses, yet these little screens around the pool could stay up. and he said it was because they basically let the air through them, since there are many holes. I had what people sending these emails usually call a "MountainWings Moment". What my dad told me also relates in the real world too. If people won't budge at all (like the cars and trees), then they'll get blown away and destroyed. But if people would act more like the pool-screens, they could survive the "hurricane" of life. Instead of always having it your way, compromise with the wind. That way you'll stay standing. 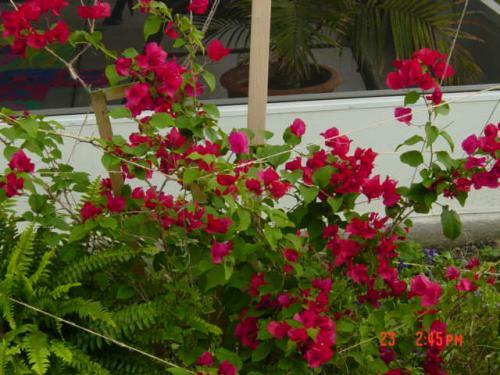 Just before Hurricane Charley struck Florida I had set out this bougainvillea in my side yard. and had all but given up on it ever growing. Boy, was I wrong. She is in full bloom right now, and looking beautiful and strong. She is a real "Plugger" and a fighter!!! in overcoming the storms that will surely strike at us. rather let me share the beauty of this plant with everyone while we can all enjoy it. OHHH - how lovely! Thanks, Adonis! at the suggestion of Dave Spriggs ('64) of VA - 09/23/03.